Philocrites: UU bloggers at the General Assembly. UU bloggers at the General Assembly. A definite high point of GA was meeting so many of my fellow Unitarian Universalist bloggers. Here's some of us at PeaceBang's dinner at Mirasol. (CK has better pictures, including a beta test of my nefarious scheme to sell advertising on my bright shiny forehead.) The food was very nice, the company charming, but I felt almost overwhelmed by wanting to spend two hours with each person. GA cruelly defeats my desire to kick back with people I rarely see: There's always too much I have to do! The dinner reminded me, more than anything I've experienced in many years, how much I enjoyed my Unitarian young adult group in Salt Lake City. Now I'm filled with nostalgia. I was a bit awestruck sitting next to Chutney, for example, whom I've admired for years but never met. I'm trying to invent an excuse to drag Mrs Philocrites to Atlanta just to have a beer with him and his wife. I already knew how much I enjoyed John and Jess's company, and PeaceBang and I cracked each other up on multiple occasions throughout GA (the pictures are on their way, my dear), and let's see: CK and her partner were delightful, even though we didn't really talk about Alfred North Whitehead. Chalicechick joined me the next day for part of the plenary, providing entertaining commentary as she admired Gini Courter's parliamentary skill. RevThom and I had a very nice breakfast, Clyde Grubbs and I enjoyed dessert together, and I was spotted having a drink with the UU Enforcer. Ogre, who may be the most active UU participant at Street Prophets as well as keeping his own UU blog, did almost everything a person could do at GA and was still serenely blogging away in the Renaissance Grand lobby late into the night. Hafidha addressed a plenary session (!) with eloquence and grace, but I hoped I'd get to talk to her more at the dinner. I still feel guilty that on the way back to the convention center after dinner we abandoned Ron Robinson and his family on the train platform. They were stuck at the ticket machine, while the rest of us had our tickets by the time the train arrived. He says he's forgiven me, but I'm just gonna apologize all over again here. Also at dinner were E—, who reminded me that I have met her before — back when she had quite different hair! There ya go. (There are people at GA who remember me with quite different hair, too.) Chalicechick's guest star, LinguistFriend, was there. Errant Frogs was there, though not especially errant. I also met Chasing Bubbles and her husband, who kindly gave PeaceBang and me a ride to dinner when RevThom vouched for our general sanity. Shawn Anthony of Lo-Fi Tribe and his long-suffering wife came to GA, but had to leave before the dinner. (She would have enjoyed the other non-bloggers at the dinner, I have to say; our other blog events were pretty uniformly geeky affairs.) Other bloggers I saw: Doug Muder, who quasi-blogged GA as part of the UUA's official coverage; Dan Harper, who discussed my blog in his GA program on content-rich UU websites; Sean Parker Denison, who I always manage to get a few minutes to see every GA, no matter how busy he is; and Lynn Calvin, with whom I've corresponded for maybe 13 years (and who offered the insight that LiveJournalers approach writing online a bit more like "covenant groups" whereas bloggers approach it a bit more like columnists or even preachers). Surely I'm forgetting others! How wonderful it was to see you all. It was an honor to meet you Chris! I really, really enjoyed meeting members of the UU blogging contingent. I sincerely appreciate the way our continued online interaction has connected us all long before actual face to face meetings. Fantastic ... You all are wonderful! My wife - in spite of her STILL not understanding why we do what we do - loves you all too! LOL! Keep up the great work. Oh, I also felt badly about Ron and his family! I knew they'd be okay, but I was so bewildered as to what happened there. Liz had a good time, too--and I think understands a little more about the whole blog-thing (though she'll probably never have one!). 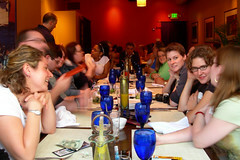 I really wish I could have met more of the great people there--the table was sooo long. i looked at those photos, and I just couldn't help thinking that it really looked like a Mensa gathering. Really? Mensa members are this good looking? !